The events of the past couple months circulating around the Palestine/Israel saga have been even more intriguing than usual. From December’s passing (and controversial US abstention) of United Nations Resolution 2334, to the Obama-Bibi breakup, to John Kerry’s 70-minute speech in his last days as Secretary of State, there has been no shortage of drama. And today’s joint press conference between Donald Trump and Benjamin Netanyahu brought us some new theater. Trump said he would be okay with a one-state solution in my homeland. “I’m looking at two-state and one-state… I can live with either one,” he told the world. 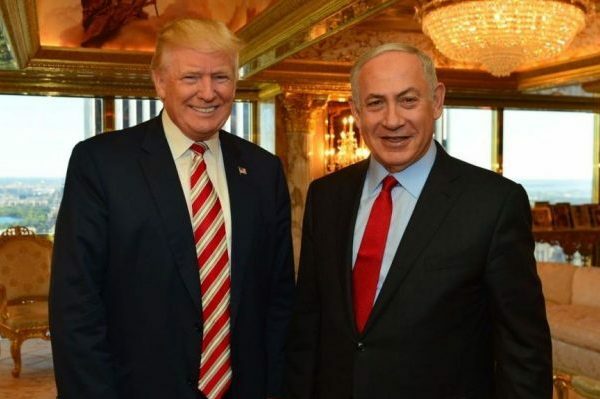 As I watched today, the President of the United States and the Prime Minister of Israel (who I affectionately call #Trumpenyahu) gave me hope. Yup, you read that right. Now, I’m optimistic by nature (There’s no other way to be a Palestinian, I think). But today I thought to myself, “#Trumpenyahu could actually liberate Palestine!” Not on purpose, of course. But I’ll take it! Netanyahu and his government want all the land. All of it. Gaza too, after they found natural gas there. (As a rule of thumb, countries don’t usually bomb places they don’t want to control.) The Israelis do have the small problem of deciding what to do with us pesky Palestinians, though. A couple days ago, Israeli president Rueven Rivlin suggested that should Israel annex the West Bank, the almost 3 million Palestinians living there should get full citizenship. Sounds good to me. Rivlin is an old-school right-wing hardliner, by the way. He’s no dove. Many on the left are scared of annexation, even going as far as to initiate a billboard campaign throughout Israel warning citizens that it would lead to a Palestinian majority in “Greater Israel” (that’s all of Palestine to all you Palestinians out there). Sounds good to me too. The Solomon effect. If you ask Palestinians to draw their country, each one of us draws the same thing, that triangular land that consists of Israel, Jerusalem, the West Bank, and Gaza. That is the land that makes us Palestinians. When you ask Israelis, guess what they draw? The same thing! Let’s not “split the baby in half.” By the way, Solomon was from Palestine, and I’m sure he would agree. We wouldn’t have to change the system of currency. Israeli shekels are used throughout Israel, Jerusalem, the West Bank, and even Gaza. Yes, those crazy “independent” (not) Islamist Hamasites in Gaza use the shekel too. So Palestinians are totally okay with it. Jesus even used shekels. If they were good enough for the most famous Palestinian of all time, they are good enough for me. The settlements can stay. Hey, Bibi, if there’s one state, you don’t have to answer any more questions about settlements. That’s right, they can just become part of the new state. Great, right? Jerusalem can be the “undivided eternal capital” of the state. No more fighting over the Holy City. Jerusalem is essential to the three Abrahamic faiths. Two states means a never-ending quarrel over the city. The world already rejects Israeli sovereignty over Jerusalem. That’s why no country locates its embassy there. One state means we can all enjoy Jerusalem equally. Palestinians have too many babies. Yup, Palestinians in Israel have a growth rate that is triple the global average. In 1948, Israel kicked out almost all of the Palestinians from its new state. Almost. About 150,000 Palestinians remained in Israel. If those 150,000 grew at the average global population growth rate, after 69 years they should be around 450,000 people. Well, today, they’re 1.7 million. One. Point. Seven. Million. We’ve taken that “be fruitful and multiply” thing pretty seriously. It turns out that Palestinian reproductive organs are more effective than any helicopter or tank in Israel’s artillery. This is mostly Israel’s fault. Unemployment and restriction of movement lead to an abundance of free time. Israel drops bombs. We drop babies. We were gonna be the majority anyway, two states or not. Just embrace it. Our economy would be the best in the world. Seriously, this is the most important element of all. God chose Palestine. Everyone wants to visit. As things stand now, billions of people don’t. Whether it’s for political or security reasons, much of the world never even considers coming to the Holy Land. One state could solve all of that. Peace and equality would mean the land would be open to the world. Imagine if Arabs from the Gulf could visit. How much money would they spend, year after year? Imagine if Lebanese, Jordanians, and Egyptians could freely come. Cha ching! We’d have to build hundreds of hotels and resorts everywhere. It would be Holy Disney! God is our natural resource. And unlike oil, He will never diminish. Those are just some of the reasons one state is an awesome idea. Of course, political, religious and social equality is good too. But for some reason, Israel has never gone for that argument. Of course, both sides would have to give up something very dear. The same thing, actually. Neither side would get to say the land is totally theirs. No Palestinian state, no Jewish state. Just a state of its people, respecting all faiths, based on secularism and equality. Doesn’t sound so bad, does it? Of course, we would have to change some things. The flag is a little too exclusive right now. I suggest a new one that represents all of us. Maybe three stripes. Brown-Green-Brown. To represent a falafel patty. Or maybe just a drawing of a hairy person with a big nose. That could represent all Semitic peoples. Men and women. We probably also have to alter the name of this new state. “Israel” sort of only represents one religion. Maybe we call it “Holyland.” Or “Abrahamistan.” Or just call the whole place “Jerusalem.” We could even call it “Palestine.” Jews should be okay with this. I’ll even change the spelling to “Palestein” to make everyone happy. Let’s do it. Let’s unite. Let’s stop fighting over land, religion, and hummus. Most of all, let’s all get rich together. Let’s put Palestein on the map! Amer, this is brilliant, my friend! And I like the proposed name of Palestein, but in keeping with the democratic nature of the interwebs, I think we need a name-the-new-one-state contest. Brainstormers are standing by now, waiting for your call! Perhaps you might find some there of interest.